The first thing is to choose the right type of bow based on your weight, physical ability and height. It is important to research various options to understand materials used, bolts (arrows) and even limb construction used. The key is to choose a bow that eliminates force and torque but also one that provides a smooth and quiet operation. You can find have one custom made, a great used bow, or even purchase a brand new bow. Some of the better materials include Dacron, which improves accuracy and range. Remember, you need a bow fit which is perfect, that is necessary to a quick kill. Therefore the most important thing for mastering hunting is to buy the correct equipment. Types of bows used for deer hunting include the long bow, short bow, flat bow, crossbow recurve bow and compound bow. Being able to differentiate each and choosing the one best for you is essential. For instance, the longbow is very long, which is the reason it is used most often by tall hunters whereas the short bow is lighter in weight and short, making it great for beginners or people of the smaller stature. You need to choose the correct arrows since each is unique and produces slightly different outcomes. For instance, a broad head arrow causes massive bleeding which may lead to death. Hence, hitting any of the vital organs, especially the heart and lungs would result in a fast kill. The single thing that can increase your odds of scoring a mature animal the most is scouting. Scouting gives you the advantage over most of other hunters and the game itself by knowing where the deer will become the first day of bow and arrow hunting season. This means you will have to get out early in the day all through the season; time-consuming but fun and productive. Evening scouting trips are typically simpler to do, and they offer less prime time. The more mature deer you can find before the season, the better. Try to get pictures or video of them where you can. Before the season begins, have them numbered in the order that you want the most and focus on number one opening morning. Scouting can mean different things for different areas. You should put the cameras where you think the bucks will be. Not only will you figure out how many deer are in the area, but you will also be able to get a good idea of their quality. That way you can pass up a smaller buck if you know there is a larger one around. 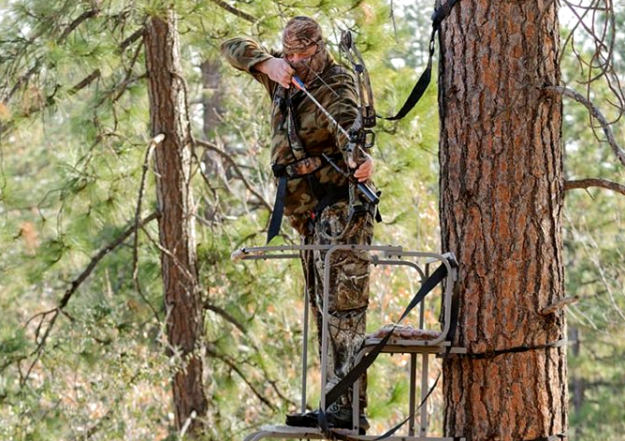 Take time to pick the best area possible for a tree stand and put it up at least a month prior the opening day of bow and arrow hunting season, so that you will have time to being used to it. It may be wise to have more than one tree stand up in various locations that you can hunt depending on weather conditions; mainly wind. For the entire hunting season, you should avoid eating peppers, garlic, and other spicy foods. This is because you want to eliminate these items in the days before your bow hunting trip. Food scent can be released via your pores. This is especially with garlic, and the deer will pick up the scent from a mile away. You need to pay close attention to anything that you carry on your hunt. You should say that are natural to the deer’s environment and diet. Good options would include, nuts, apples, peanut butter, etc. You do not want to bring bologna sandwich or a roast beef with you. The deer will smell the beef, and it will run away. Before you go hunting, be sure to wash your body with a good hunting soap. It will help neutralize your scent. Practice doesn’t mean perfect if it’s not done in the correct way. A lot of deer hunters shoot from tree stands, but only a few practice shoot from an elevated position. You should always dress in your hunting gear to practice before the season. Do not underestimate what even just the feel of a heavy outer layer can do to your shot. In case you plan on hunting in low light, practice in low light. Your maximum effective range will always be shorter than you expect. Being able to shoot from different positions is vital for anyone who hunts with a bow. Even though many hunts from a tree stand, you may also be interested in using a blind, or stalking. The best position to remember is kneeling. Kneeling allows you to hide out of sight from the animal when necessary. It’s also an easy position to get into when on the move. You should not just assume that the perfect spot that you went hunting last year would still be the best place to go. Explore new places. Technology these days helps you to get a view of hunting grounds; which include images detailed enough to help you pick the best spot for a tree stand, from your living room. You can also use Google Earth and zoom in to see deer trails in the fields. What is the best thing you can do to become a better bowhunter? Get out there, hunt, Practice, and experience. Have a great season!